A while ago, Hollerbach’s Magnolia Square Market started serving "to go" sandwiches and sides, and I tried some recently. Very good! We both enjoyed our sandwiches and our sides. However, I have to say that Tommy's was the better sandwich, a home run with the beef and horseradish sauce. But everything was wonderful. A nice little sandwich shop using top of the line ingredients--how can you go wrong! Good eats, for sure! When we saw the Whiskey Pulled Pork Sliders on the City Eats Food Truck menu at the Lake Mary Food Truck Crave, I just knew we had to try them. We were not at all disappointed, they were very good. First off, the bun was right for these little gems, an egg enriched, nice and soft bun. 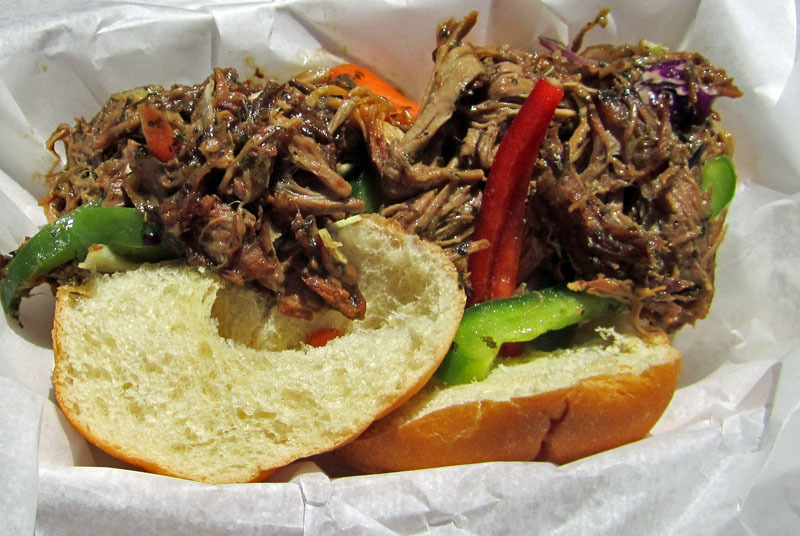 Next there was the pulled pork--it was nice and tender and had a great pork flavor. And then there was the slaw that was a part of this: pickled cabbage, carrots, onions, and peppers--all added to the tremendous flavor. The only thing I didn't like was when I finished the last bite--I wanted more. I can't wait to try some of their other menu items another time--I'll be back to City Eats Food Truck in the future, for sure! We tried Mi Casita on Wheels Food Truck at the Lake Mary Food Truck Crave recently. 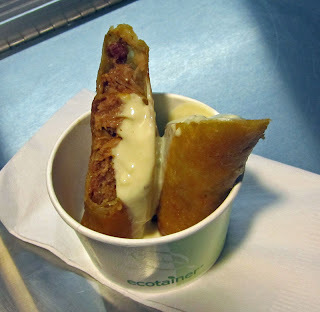 We'd already had quite a bit of food elsewhere, but I just had to try one of their Chicken Empanadas. I was rewarded--it was very good. 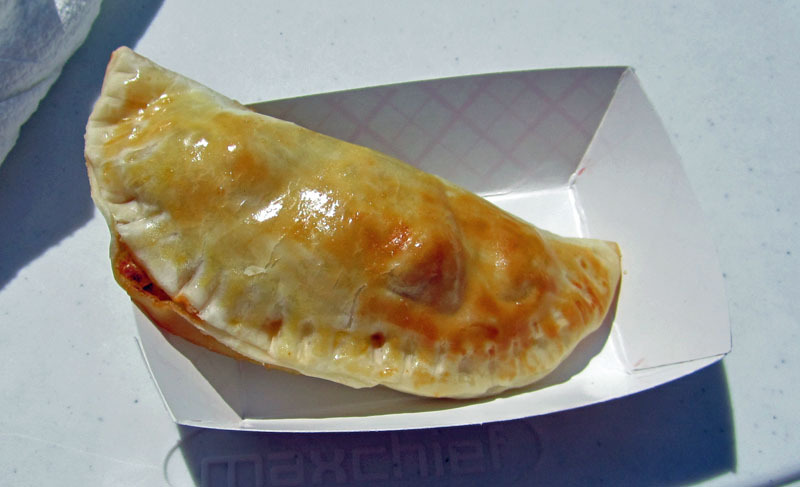 The empanada was nicely baked--the crust was exceptional, washed with a bit of egg wash, and crisp yet tender. The chicken inside was tasty, with a bit of chili spice flavor. For $2, it was a great few bites. Next time I see this truck at an event, you know I'll be sure to try something else. Nice first bite! 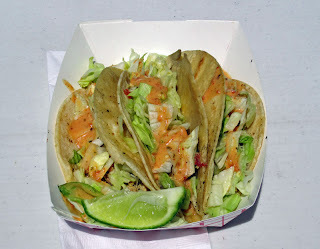 We discovered Louie's Bistro Food Truck at the Lake Mary Food Truck Crave recently, and I liked what I had... the California Chicken Tacos, basically chicken tacos with a chipotle lime crema, but with a twist--olives! Yep, olives. These were very good. What stated out as a normal, nicely flavored chicken taco with some lettuce and a chipotle lime crema (itselve very nice) was taken up a notch by the chopped olives that added a nice note to the tacos. Add a bit more lime juice and these were very quite good. My only complaint was the wait time, but maybe they were a victim of their own success--it took a full 15 minutes to get my chicken tacos. Were they worth the wait? Well, because I'd already eaten at other places, I'd say "yes." But for future reference, if you're extremely hungry, you may want to find faster service. Still, overall, these were very good and certainly worth waiting for, since I was already quite full! We went to our first Lake Mary Food Truck Crave today, and the first thing we tried was the Miami Sould from Silver Bistro Food Truck. It was good! They describe it as "...two worlds collide in this sandwich with slow roasted mojo seasoned pork, sweet ham, melted smoked gruyere cheese and kimchee, pressed inside toasty crusty bread and served with a side of key lime aioli for dipping." 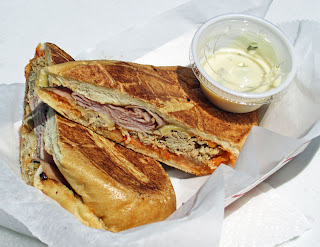 Basically, it was a Cuban Sandwich, but with a twist, and I liked the twist. I could have used jsut a bit more of teh key lime ailoi, but all in all, this was a great sandwich. It had the tastes of a cuban minus the pickle and yellow mustard, but with the kimchee which brought a nice tang as well as the texture of a pickle. All in all, a very nice sandwich! I'm looking forward to trying some of their other offerings at a later date. I had dinner at Rainforest Cafe recently and was quite disappointed. The food was just not that good, thought it started out on a good note. I was in town for a few days on business and staying near the Sawgrass Millls Mall. I'd heard of Rainforest Cafe and so decided to give them a try. 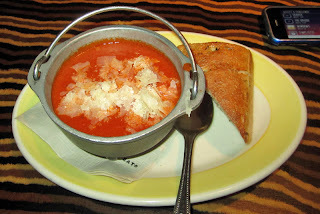 I started out with the Tomato Basil Soup, and it was pretty good. The presentation was spot-on, being served in an aluminum "pail." The taste was also good, with a nice tomato flavor, very fresh, and a hint of basil. The shaved parmesan gave it a nice bite, and the parmesan toast served with it added a nice texture. This was the best thing I ate, though. I also had a salad. It was notable for it's lack of noteworthyness. Chopped iceberg lettuce was topped with some chopped cucumbers, chopped carrots, and chopped tomatoes. There may have been other ingredients, but if there were, they were not worth remembering. Everything was put on a plate in some sort of automaton order, no real thought given to plating. The dressing was--thankfully--served on the side. I was also worth noting that it was quite forgettable. An average salad like I'd expect to find in a cheap diner. Not that good for the price/atmosphere of this place. 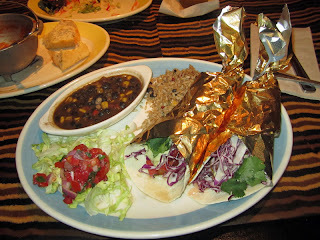 Lastly, I had the Fish Tacos for my main course. The presentation was nice. Unfortunately it was the best thing about the dish. The fish tacos themselves were a muddy mess of little flavor. I'm not sure just what i tasted in there, the flavors were very confused. Add to that the rice--bland--and the beans--mixed flavors, nothing really stood out. 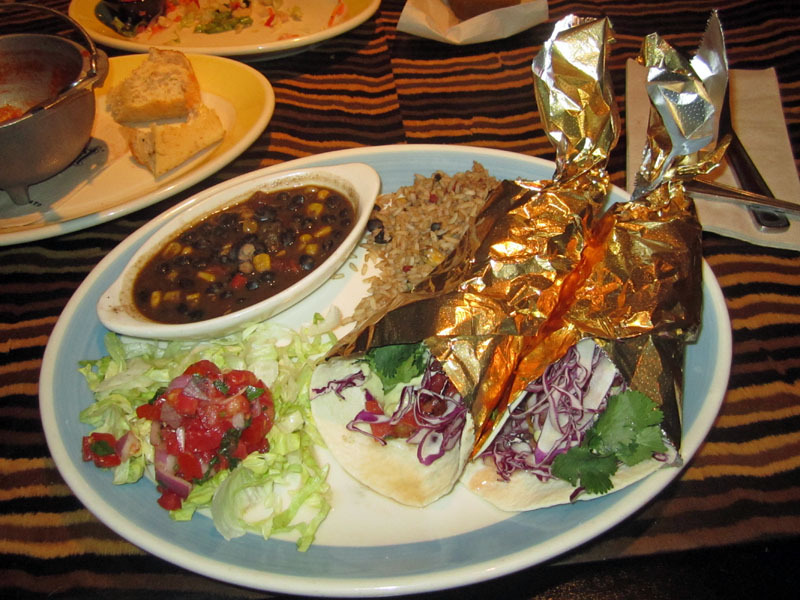 I've had a lot of fish tacos--these may have been the least flavorful I've ever had, and when you consider the prices, I'd definitely not have them here again. Over all, my meal was mediocre at best. Given the price, it was not much of a value. I woudl not return. But then again, you can be your own judge. I saw Donna's Caribbean Restaurant and just knew I had to try it for lunch. It was a good choice. 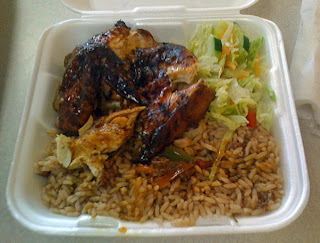 I had the lunch special--dirty rice with some goat stew gravy, jerk chicken (I had the white meat), and a bit of salad. There was nothing fancy about the food or the service or the presentation here. But at $4.23 (including tax) for a good meal, how can you go wrong. Yep, I said it, it was a very good meal. The rice with the gravy was plenty flavorful, a nice meaty flavor. The jerk chicken was a bit dry, but still tasted very good. And the salad was a nice compliment to it all. Best of all, it was more than enough food for a lunch. I ate in as I was on lunch break during a work training seminar. But during my time there, they had steady traffic, a testament to the good food. Nice job, well done! I stopped at this Anthony's Coal Fired Pizza location (Palm Beach Gardens, FL) on my drive home to central Florida from a business trip to the Fort Lauderdale area, and I had a very nice lunch here--the pizza is very good. I drove up exactly at opening time, 11 AM, but no worries, though I was their first customer of the day, they were open and ready for me. As I was on the road, I did not hesitate, but ordered a pizza with sausage, pepperoni, mushrooms, onions, and tomatoes. In due time it arrived and it was all I'd hope it would be. The onions were caramelized, which was a nice touch. 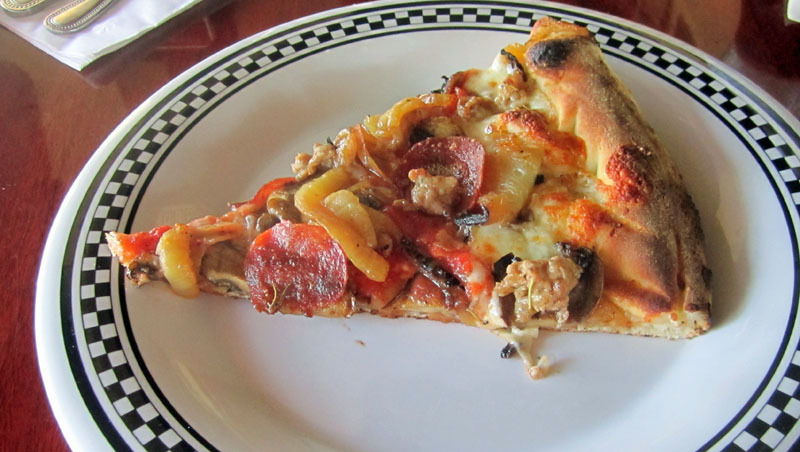 The pizza was, as they claim, cooked well done, but very good and flavorful. All the ingredients appeared fresh and the taste was outstanding. Of course, the crisp crust was indeed nice and crisp. I really like this style of pizza and I know another visit to an Anthony's is in my future. Yumm! Oh, and by the way, did i mention that the service was top notch? Well, it was! Wow, I had a really good lunch at Thai Thai recently, what a pleasant surprise. 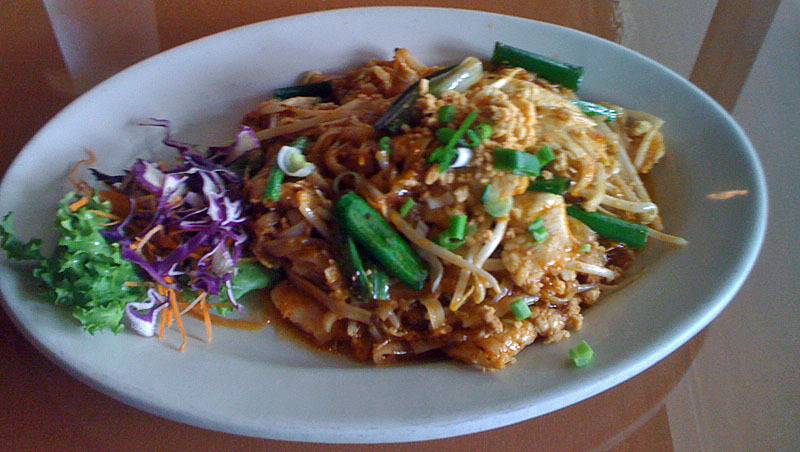 I was in town on business and Thai Thai was nearby, so I thought I'd give it a try--it was a fortunate choice. I had the Pud Thai and it was very good. Very fresh red cabbage, carrots, and lettuce garnished a freshly made Pad Thai, brimming with flavors including peanuts, bean sprouts, chicken, scallions, and a host of other flavors. It was not overly spicy but rather had a very nice mild flavor. I loved this dish a lot and would certainly return to Thai Thai again and again if I lived in the neighborhood. 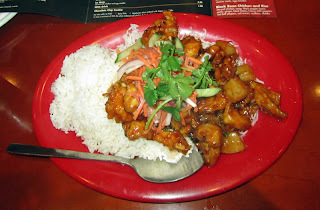 I had dinner at Pei Wei Asian Diner recently. It was OK, but just OK. I started with the Hot N Sour soup. It had a strange "burned" flavor to it, not that appetizing. I would not order it here again. For my main course I had the Carmel Chicken. It was OK, not too bad. The chicken was cooked and fairly tender. The pineapple was a nice touch. The garnish made it look really good, and the sauce it was in was rather tasty. It was served with white rice and in general was a fairly good value and a filling meal. I'll probably come back again, but would not order the Hot N Sour soup again, I've had much better elsewhere. I learned a good lesson on my recent visit to P.F. 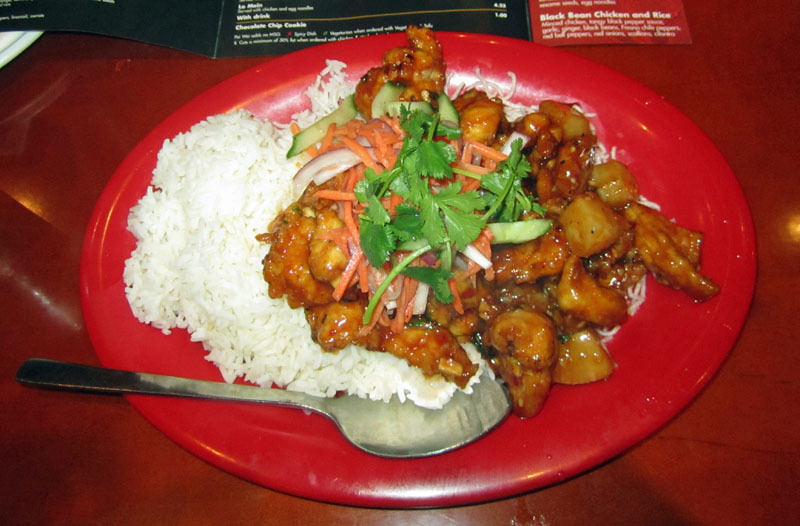 Chang's China Bistro--ask what the price of the special is if you're going to order it. I was in town for business and decided to give this place a try for dinner. All the dinners seemed reasonably prices and within my expense account, in the $15-$20 range. I was ready to order, but the server mentioned the specials, one of which was a Seafood Trio, Sea Bass, Scallops, and Shrimp. I was sold--but I should have asked the price--and he should have told me, because it was WAY, WAY OUT OF LINE with the regular menu prices. The price? $29.99! Outrageous. And it was not all that good. It was a large portion of Sea Bass, but it was not cooked through. The outside was tasty enough, but the inside was not cooked and was tough. 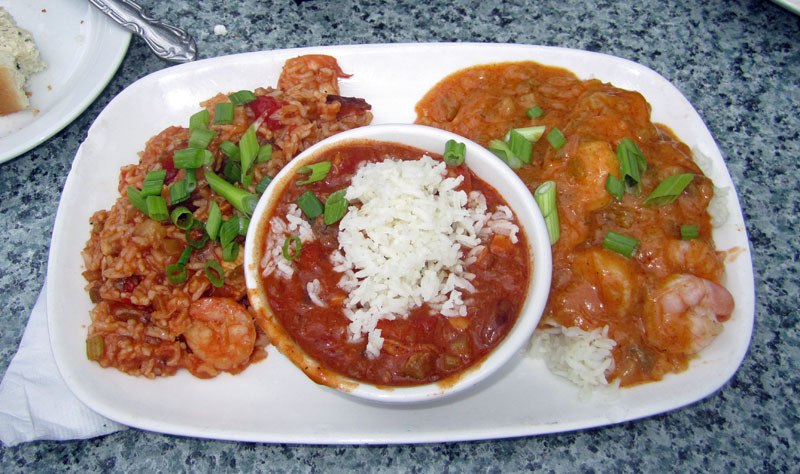 The scallops and shrimp were breaded and fried and were less than ordinary--I've had better at a cheap bar along the Intracoastal for a lot less. So overall, I was totally unimpressed. I've never been a big fan of P.F. Chang's but decided to give them a second chance. Bad choice. Never again! Talk about horrible service... 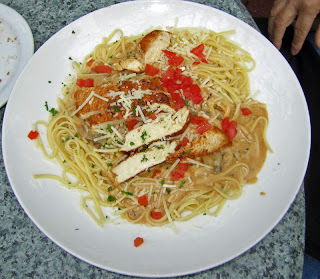 I was literally the "invisible man" on my attempt to eat dinner at Grand Lux Cafe recently. I had high hopes for the place as the menu looked good. But it was not to be. Upon entering, I was promptly greeted by the hosted and led to a seat with the (false) promise that "someone would be right with me." I was dining alone, in town on business, and seated at a narrow table separated by a small space from the table of four next to me. Embarrasingly close, I'd say. During the next 10-15 minutes, the waiter visited that table twice, the table next to it at least once. Server upon server passed me by. I'd long put down the menu, longing for even just a glass of water. Finally, in desperation, after well after 10 minutes (that I timed) had passed, I picked up my iPhone and called the front desk. My simple question: "how long do you expect someone to wait in your restaurant for their server to visit them?" In all fairness, they tried to be apologetic and help, but by this time I was out of patience. To add great insult to injury, as I was about to leave, the waiter (who'd visited the next table at least twice in the last 10-15 minutes) finally came up to me. Guess what he said? "I'll be right with you".... as he turned and walked away. I did the same. I will never return to this restaurant nor visit this chain again. Is it any good? Well, they lost any chance they ever had to make a good first impression. 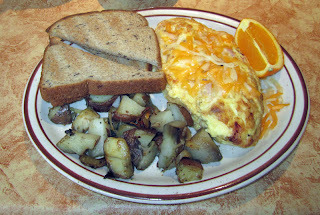 We stopped for breakfast at Athena Restaurant when we were visiting St. Augustine recently, and had a very pleasant breakfast. We were promptly greeted, seated, and given menus. I had a ham and cheddar omelet, and it was excellent. Lots of cheddar, nice and sharp, with a large amount of cheese. And it was cooked perfectly. The breakfast fried potatoes that accompanied it were very good with a lot of nice caramelized onions in them. And the whole wheat toast was nice and hearty. It was a good way to start the day. 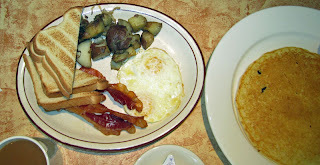 My friend Tommy had a very nice breakfast, too, with eggs cooked to a perfect over-easy, bacon and sausage, and the breakfast fried potatoes. He also had a pancake which was huge but equally good. We both agreed that the food was good, the portions decent and the price fair. On top of that was had very good, friendly service. This breakfast was a hit on all accounts! We visited St. Augustine recently and decided to drive just north of the city along the ocean. There we came upon the small beach town of Vilano, and we had dinner there at Beaches on Vilano. It was pretty decent food for a beach town. Beaches on Vilano is actually located by the marina and pier, right on the Intracoastal Waterway with a great view of the high-rise bridge that brings A1A from the mainland to the sandbar. It's very typical in decor for such a place, kind of laid back. But our service was certainly not laid back and the food was actually quite decent. My friend Tommy ordered a chicken sandwich and it was delicious. 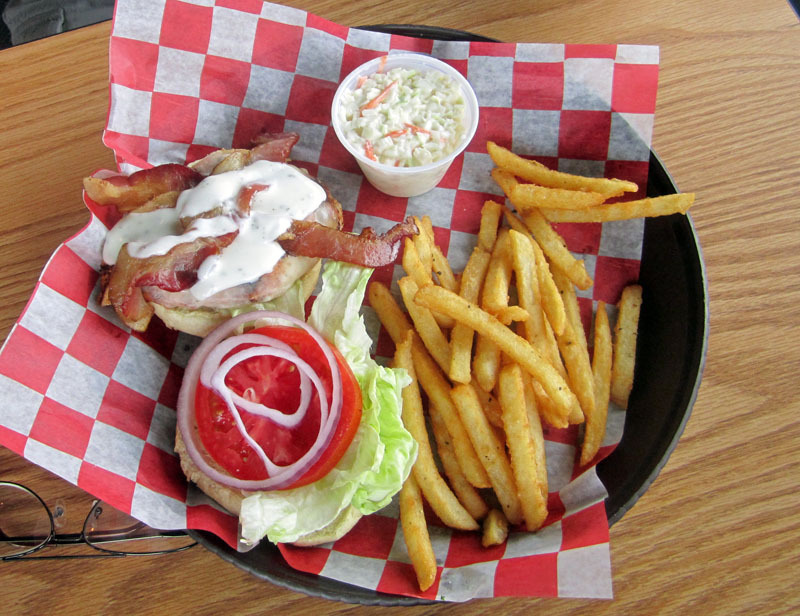 A generous portion of white meat was nicely grilled and blackened, topped with bacon, lettuce, tomato, onion, and some provolone. Nothing too spectacular, but definitely good eats. The fries that accompanied it were very good, seasoned fries. They were quite tasty. The coleslaw was pretty ordinary, but overall, this meal hit the spot. I started with a salad. It was good and somewhat on the fancy side for a beach town supper club type of place. Mixed greens were topped with tomatoes, cucumber, cheese, green peppers, and diced red onions. The balsamic viniagrette was served on the side. It was a good salad. 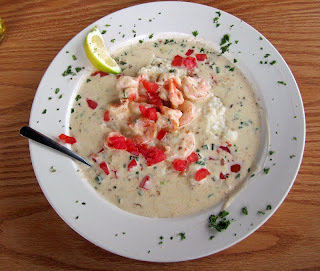 For my main dish, i had one of my favorites, Shrimp N Grits. It was very good. The grits were very creamy and tasty and a bit cheesy. 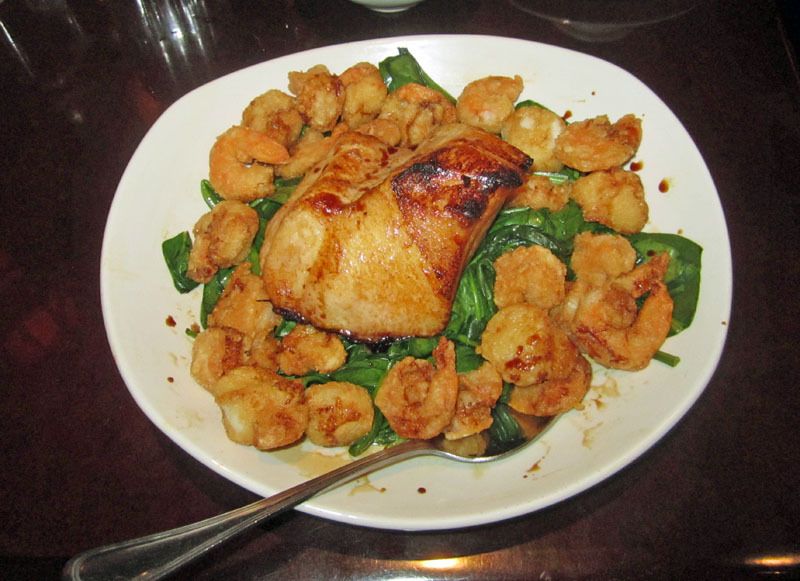 The shrimp was well cooked, maybe a half minute too long, but not rubbery. Fresh diced tomatoes topped the dish. It was very good and I ate every last drop. Overall, a very nice lunch here, I was impressed. Nice place, nice atmosphere, great service, and good food. And the beer was cold! Interesting name, great food! We were wandering historic St. Augustine recently and stumbled upon Gaufres & Goods, proclaiming that they serve Greek and Polish food. Since I'm of Polish ancestory and have visited there several times, we just had to eat here. We were not disappointed! It was great! 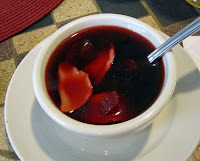 I started off with the barszcz--beet soup. I've had many, many varieties, and this one was top notch. A clear beet broth had tons of flavor. It also had some diced beets and, best of all, was served with uszki (literally "little ears)--miniature pierogi stuffed mushrooms. 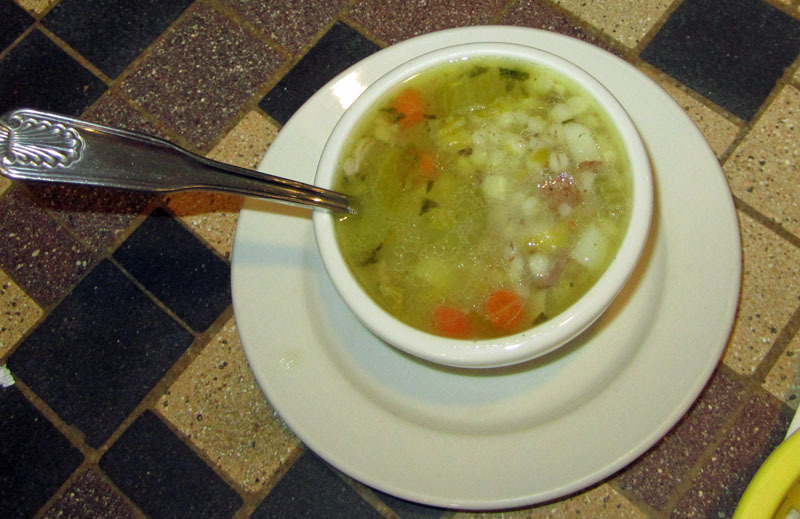 The soup was hot and tasty and had a nice hint of acid. The uszki were the perfect compliment and added balance. This was great. For my main course I ordered the Taste of Poland. I am of polish heritage and know Polish food. I've even eaten Polish food in Poland. And this place serves Polish food. The Taste of Poland included four pierogi, fried with a bit of onion, each one better than the previous one. I had three different "flavors," the meat, potatoes and cheese, and sauerkraut and mushrooms. They were all excellent. My favorite, if i had to name one, would be the meat, simply because they are the hardest to make and flavor properly, but these were. Suspecting that they were hand made in house, I asked our waitress. Indeed, they make their own. It shows. My dinner also came with the "national dish" of Poland--bigos--often called "hunter stew." It was awesome. Cabbage and sauerkraut form the backbone of the dish, onions and mushrooms and a bit of tomato provide flavoring, and kielbasa and other meats provide the protein. In Poland, everyone has their own favorite (and highly guarded) recipe for bigos. This one was right up there. I loved the way it was served, almost like a salad on a whole grain bun--itself very delicious. This added a definite European and Polish note to the meal. My friend Tommy opted for soup and salad for his lunch. The soup was Beef Barley and I had a taste--it was delicious wiht a nice meaty broth and rich barley, seasoned with carrots and onions--wonderful. 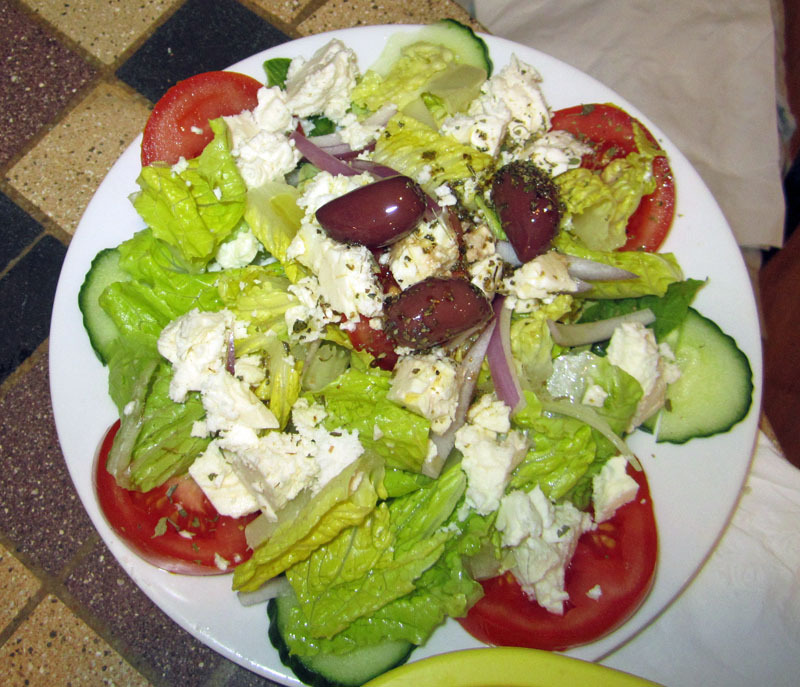 His salad was a greek style salad and that makes perfect sense, since Gaufres & Goods bills itself as a Greek and Polish restaurant. The salad was very good too, with olives and feta cheese, tomatoes and cucumbers--nice and light and refreshing. I am always excited to find a restaurant that serves Polish food. With Gaufres & Goods, I found one that serves excellent Polish food. I sure wish I lived closer to St. Augustine, I'd be a regular. Give it a try, I highly recommend it! I went back to the Sanford Food Truck Bazaar in search of dessert, and came away with an excellent BBQ Pulled Spring Roll from the Fork in the Road Food Truck. We'd eaten earlier and took a break, but then decided to go back for dessert. I found somethign better, and this was it. This was very, very good. It was slow smoked and pulled Kurobuta (Berhshire) pork shoulder with a chipotle BBQ sauce and pickled red onions, rolled in a spring roll wrapper, deep fried, and served with a smoked blue cheese sauce. It came out fresh and hot and each bite was wonderful. I could taste the pork, first and foremost. The pickled onions added not only flavor, but texture. The crisp wrapper was just that, crisp. And finally the smoked blue cheese sauce gave the spiciness of the chipotle a very nice offset. It was a great dessert! 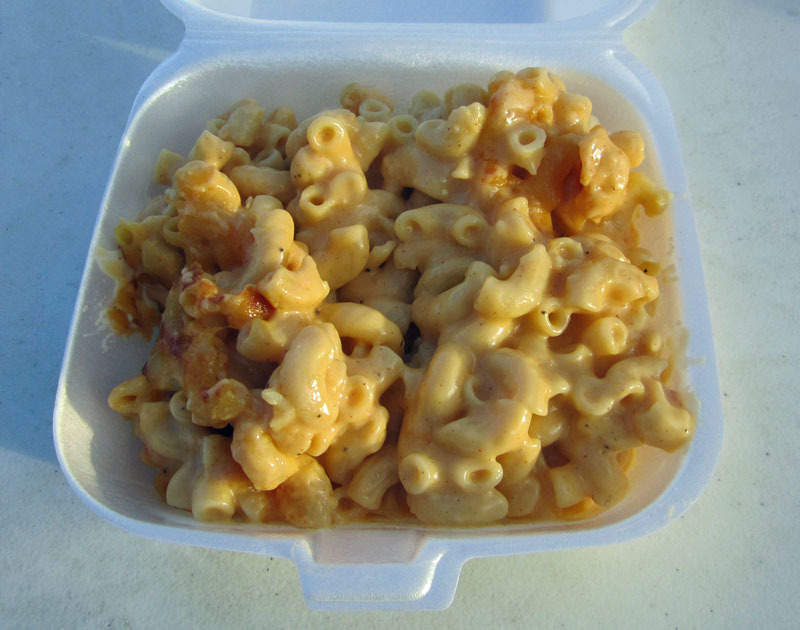 I wanted to find some really outstanding Macaroni N Cheese at the Sanford Food Truck Bazaar the other night, and so I tried the offering from the Gastro-Truck. It was ooey and gooey as a good mac 'n cheese should be, rich and creamy with a nice cheese flavor. It was good, but it was not the gourmet "great" that I was looking for. For down-home comfort food, this was good. The macaroni itself was a bit overcooked, I'd have preferred a bit more bite to it. The cheese sauce was creamy and rich. But the texture was pretty much all the same throughout the dis. It could have stood to have some texture contrast--maybe a bit more "burned" or caramelizes, maybe a few bread crumb, possible some onion or bacon or...well, just something. 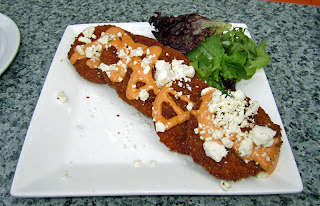 So, while I found it good and comforting (and we ate the whole full-sized portion), I did not think it to be "gourmet." Good, yes. Great, not this time. We were at the Sanford Food Truck Bazaar and my friend Tommy had the the Chicken and Waffles from Melissa's Chicken & Waffles Food Truck. 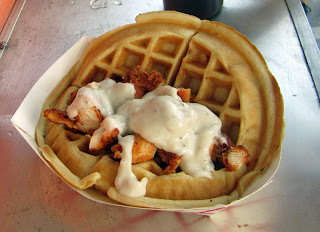 While the waffle itself was a bit wimpy, the chicken itself was outstanding, a bit of heat, very fresh and nicely deep fried. The sausage gravy and the waffle and syrup complimented the crisp heat (literal and spice) of the chicken and it made for a very nice meal. Super Yummy! 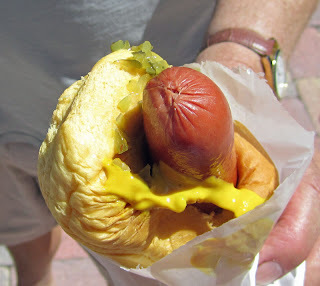 Tommy says he'd eat this again. The few bites I had confirmed that it was indeed delish! The first thing I had to eat at the Sanford Food Truck Bazaar the other night was the Slider from the SwedeDISH Food Truck, and I loved it! It was described as an all-beef patty, Swedish style! 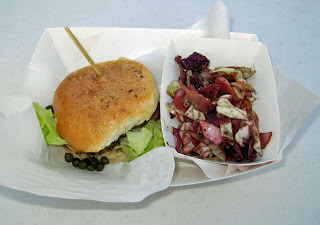 The burger was tender and juicy with a slight hint of beet and topped with some capers. It was expertly cooked and not at all dry, but very juicy. 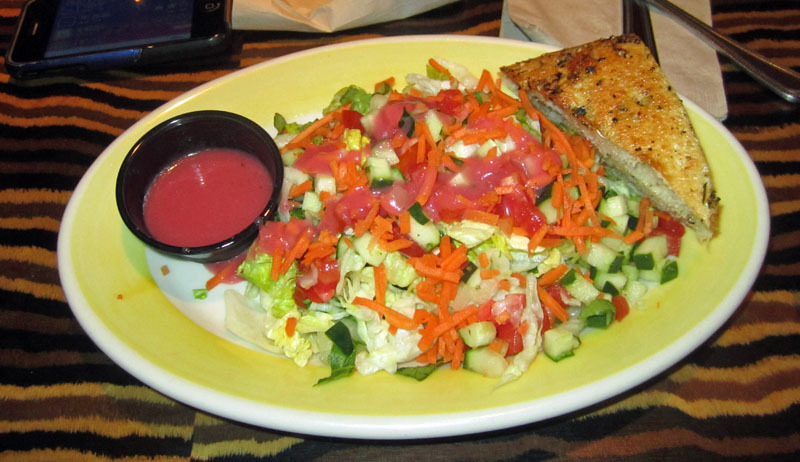 It was accompanied by a bit of fresh red and green cabbage salad. 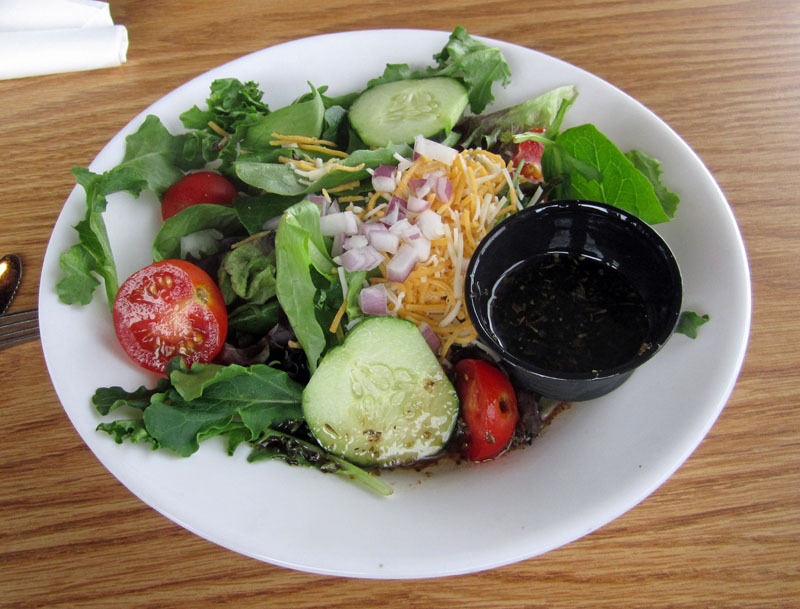 The salad itself was great and I could have eaten a whole bowl of it--I detected some balsamic but it was not overpowering, just wonderful and delicious. There were other things on their menu that looked very good, and I'm sure I'll try some of those on a future visit. Nice job!